Why You Need Them: To notify your client of a problem before it becomes an issue. One of the problems I had managing teams of employees were the issues that were encountered while the team was at their scheduled appointment. These were sometimes just silly little policies overlooked by the client, but made it difficult for us to do our job. When the boss isn’t around, the client will take advantage! It wasn’t enough that my team lead would discuss the issue with the client! Sometimes the client wanted to argue with my employee, thinking they were alone and defenseless. Employee Request or Company Policy? Well – they just needed a gentle reminder from the business. After all, was it an employee request or was it a company policy? The temperature is dropping and we could still have heatstroke! These notices are created in MS Word and ready for you to add your company name and phone number. Don’t want to make the changes yourself? Then use the pdf documents that are included and do not have to be customized. Each notice is printed 2-up – that means they are 2 on 1 sheet of paper. All you have to do is print the notices and cut them in half. Use your own paper cutter or take them to the nearest office store and they’ll do it for you! Your purchase includes complete instructions for use. 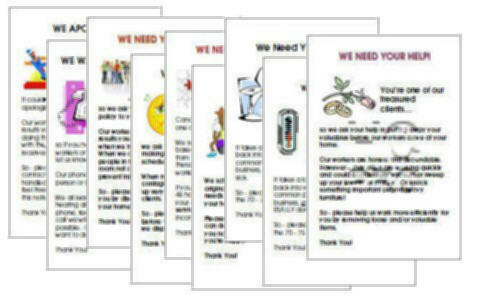 I designed these mini flyers to be left behind when a job is completed to notify the client of an issue. When the client is home, it’s solid proof of your company policy and not just the whim of the employee. Get All 9 Notices Today! How do the Client Notices Work? Here’s the deal….many very good clients can easily become a nightmare, if you let them. After all, your employee/worker is the only “face” they see representing your company. Pretty soon they start to believe the worker(s) are their worker(s) and not yours! If you are doing the cleaning yourself, this is a non-confrontational way to gently remind your client of your policy. I know, I know – your worker(s) are supposed to be keeping them happy. Consider this…you are running a business and you are responsible for your workers. You have related overhead that could be affected when your company policies are ignored – possibly even risking your insurance rates. These Client Notices gently remind your client about your company policies while inviting them to discuss the issue directly with you. As your worker explains the situation to your client, a Client Notice is handed to them at the same time. If the client is not home, your worker will leave a Client Notice along with the other paperwork you leave at the end of an appointment. I never had another problem with an issue after using these Client Notices. Sure – they may need another reminder, but that’s why you have the notices on hand!